Esther P. Zibell is a French born artist who is mostly self-taught and has been painting since her early childhood. In the eighties she became an observant Jew and dedicated her work to Biblical and Hassidic themes imbued with her sensitivity and talent. Esther has exhibited her work internationally in: Paris and the Cote D'Azur, France; Montreal, Canada; New York City and Brooklyn, NY; Jerusalem and Tzefat, Israel. Esther spent nineteen years in Brooklyn, NY. While there, she studied print-making at the Art Student’s League of New York. In June 2016 she made Aliya with her husband to Tzefat, Israel, where they presently live in the Old City's Artist Quarter. 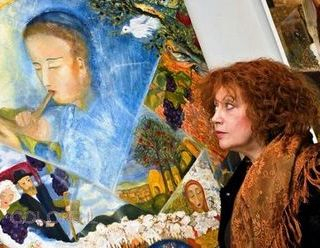 Esther has spent much of her life dedicated to art; employing her imagination, sensitivity and originality, she has developed a style uniquely her own. I started painting when I was 3 years old and I have never stopped since. As a self-taught artist, my goal has always been to keep a pure and emotional connection with my subject, and to communicate this sense of wonder to my viewers. An important part of my work is Jewish themes, but it is not “Judaic Art”. I try to go beyond the description, and touch the soul and essence of the event. I think that whatever I create, whether I paint flowers or do print making, the goal is essentially the same: to bring people deeper into the subject, and maybe, even allow them to feel the Divine within it. women young and old, wedding scenes, and mothers and children. as Matisse, Redon, Chagall, Soutine and others. The work of Esther P. Zibell... offers a sentimental, witty and intimate glimpse of Orthodox life around the world. One of my favorite examples is Safed’s Cats depicting no less than 13 black cats hungrily watching a Hassid barbecuing by the moonlight in his Safed backyard. Unique of its kind.